In response to an invitation to submit this essay, I regard this opportunity as an honor, and I am gratified. The ESRI Conservation Program coordinator, Charles Convis, extended this invitation, and it presents his ever willingness to always include Native people in his program activities. This first issue profiles only a few of the unique endeavors of the North American aboriginal people. These activities are very meaningful examples of how Native people are embracing the spatial information technologies. I have been fortunate and honored to have shaken hands with many practitioners of culture and technology from across the lower 48 states, Alaska, and Canada. My insights and experiences are derived from direct relationships with tribal and other GIS visionaries who are seeking to promote, implement, and apply the spatial information technology within Indian country. The actual story about Indian GIS is complex but definitely flows within a continuum of historical and culturally significant events. Of great interest in understanding Indian GIS is what is recognizable in every culture that regards life as a relationship with the earth as Mother. This philosophy is ideally the foundation for the critical thinking process in developing their spatial information solutions. These concepts have transcended from concepts of origins and the placement within the universe and a respective geographical region. When one finally understands the total story today, it will encompass a perspective of a continuum that begins historically to the present and on to the future. The applications profiled in this issue carry a unique vision that ensures the survival of their culture and the protection of limited resources within a fixed land base that history has left them. As a Lakota, I can only relate a perspective of the Plains Indian worldview that parallels the concepts and philosophies of many other indigenous cultures. One must understand the age of indigenous cultures on this continent and how concepts of original geographic information systems have evolved through close observation of the natural world. Within the observation and learning styles of Native people, these experiences have evolved beyond knowledge and are now within the realm of wisdom. Today this is validated by observations from space missions and the revelations to promote the earth sciences. This makes me believe that the ancestral decision making processes are applicable for every contemporaneous application. As the picture above depicts leaders in a decision making process, these same issues are being addressed today and solutions are proposed by the utilization of new tools and appropriate digital data sources. The picture also records the evolution of Plains Indian culture that has embraced the rifle and horse for the betterment of their nation. It is important to realize the trait of aboriginal cultures to adapt and "Indianize" new and important resources. Another aspect to this story is the historical record that Native people have been colonized and paternalized by federal government policies. The history of this modern era has left many nations with a fixed land base and imposed governmental processes. This has placed many tribal governments in a reactionary mode of operation. 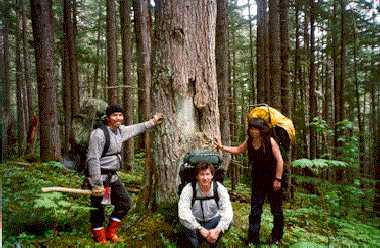 Other activities in Canada include the process of establishing treaties with First Nations in the Province of British Columbia. Prior to this, successive numbered treaties were made in the later 1800s with First Nations in all the other provinces except British Columbia. A good example of First Nations' GIS in action is the employment of significant maps to establish aboriginal title to respective traditional territories. This process integrates the First Nations' worldview in concert with a defined protocol for negotiating a modern treaty with the province and Crown of Canada. As a result, First Nations are qualifying and utilizing digital data from various sources. The data beyond their own includes private industry and provincial and federal ministries. Particular progressive First Nations have developed seamless data sets within their traditional territories that supersede what anyone else had done. This equates to a reason to integrate information that follows a specific First Nations vision and goal. The examples I mention are just a few. What I hope to explain and impart is the fact that Native people are spatial reasoners, and the adaptation of new tools and the use of digital data is the only difference from yesteryear. A colleague and I attended an International Cartographic conference at the Newberry Library in Chicago back in 1995. A man by the name of Malcom Lewis from Sheffield, England, presented his research and examples of his collection of ancient North American maps. His presentation validated Native cartography. Such research does present a tremendous opportunity for Native people to understand their traditions and carry those traditions into this new century with new tools and data. 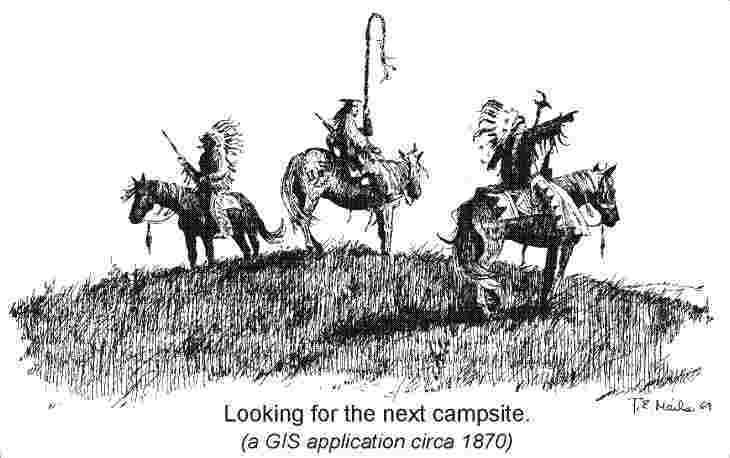 As a Lakota, when I heard his presentation that validated native cartography, I immediately thought of information technologies my ancestors developed. They had star knowledge, star maps, winter counts, and ledger drawings that augmented our oral traditions. Somehow today, I have a better understanding about the graphical designs my ancestors developed that represented time and space. Many of those designs were geographical. A sound example is the designs on Parfleche containers and other accoutrements that were in essence maps that depicted geographic features such as a river as the circle of life and the mountains that hold us to a spiritual connection within our homelands. As I think more about this, I wonder if America will make those connections someday and cherish this land for what it provides. Today new relationships are being made, and a good example is the NASA connection for Native people. As a result of the Climatic Change Assessment that is underway, Native people have been sought to participate and relate their perspectives of climate change. This activity presently resides with the Native Peoples/Native Homelands initiative. Another good example of opportunities is a recent Presidential Executive Order that has government agencies starting to work closely with American Indian colleges. Already the American Indian Higher Education Consortium has signed a memorandum of agreement with the USGS. Another timely connection is a new relationship in the making. It is the sign of the times and an activity that profiles the first American Indian university, Sinte Gleska University (SGU) on the Rosebud Sioux Reservation of South Dakota. SGU is the newest member of the Upper Midwest Aerospace Consortium. Within the consortium are the opportunities to exchange critical knowledge and research about the earth with remote sensing. Here lies the ultimate challenge to blend technology and the traditional knowledge. Sinte Gleska University is on that cutting edge of research. SGU will be offering relevant courses and developing curricula to accommodate tribal spatial and spectral technical needs. Already, the Lakota Studies Department has embraced the concepts of remote sensing and will be initiating culturally relevant research that will employ GIS/RS. Jhon Goes In Center, a founder and former President of Innovative GIS Solutions, Inc., a Colorado company dedicated to the responsible assessment, implementation and application of Geographical Information Systems technology to a wide range of disciplines. Jhon Goes In Center is a member of the Oglala Lakota Nation. His combined citizenship with the Oglala Lakota Nation, the United States and the State of Colorado forms his perceptions and ideals as a driving force for his company’s business model. As well, his vision and commitment to GIS technology is as a vehicle for addressing responsible land resource management initiatives in conjunction with the considerations and protection of cultural resources. Goes In Center is an active member of the American Indian Science and Engineering Society and is a member of the Faculty and Aboriginal Programs Advisory Council for the Banff Centre of Management in Banff, Alberta, Canada. There he teaches and advocates technology transfer processes for First Nations and Native American people.